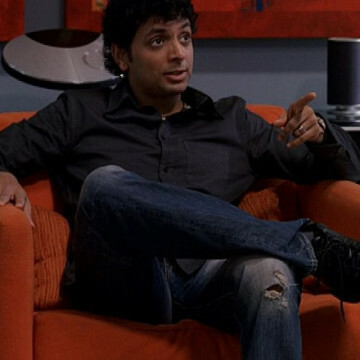 M. Night Shyamalan offers a cameo appearance in S04E04, titled Sorry, Harvey, as part of the episode’s Ari Gold subplot. M. Night gives Ari a script for his newest movie, and when he loses it due to a valet’s mistake, Ari goes to great lengths to relocate it. M. Night Shyamalan is one of many high-profile directors to offer an Entourage appearance; his larger films include The Happening, The Sixth Sense, and 2002’s Signs.